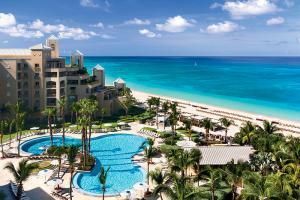 This exclusive oceanfront resort delivers a grand level of relaxation and luxury. Situated on 144 acres stretching from the Caribbean Sea to the North Sound, the resort features 365 guestrooms and suites. An unmatched collection of resort amenities and experiences await including four signature restaurants and the Caribbean’s only AAA Five Diamond dining experience, Blue by Eric Ripert; la prairie spa; the nine-hole, Greg Norman-designed golf course; The Courts by Bollettieri, now in partnership with Florida’s prestigious IMG Academy; eco-adventures and family activities with Jean-Michel Cousteau’s Ambassadors of the Environment; and, Starfish Cay, a new interactive water attraction for families. Beachfront on Seven Mile Beach. The Butterfly Farm, Stingray City, "Hell", Rum Point, Perdo St. James Castle.